Thank you so much. These glasses are great! I just received my glasses, I ordered the c1526 in black, and I absolutely love them. They feel great, and they look awesome!!! Thank you so much. You guys are great! Thank you. This is awesome customer service. 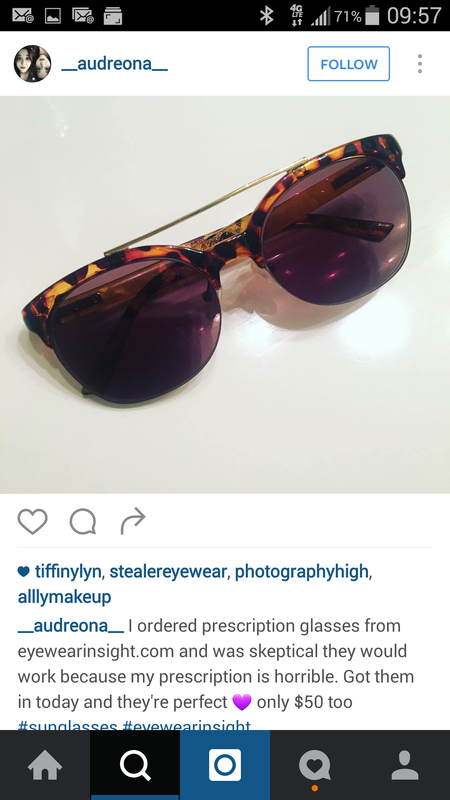 I will definitely recommend your business, and will continue to purchase more glasses. Thanks again. Yes I received them today. Much better. Thank you again for all the great service I have received from your company. Great eyeglasses at a great price. I love my glasses, and get so many compliments on them. I highly recommend them to all my friends. High quality product and a fab price. I just got them about an hour ago and absolutely LOVE them! You won't believe this, but I'm thinking I need a backup pair of Transitions! I must admit I was a bit skeptical about buying eyeglasses online,but have to say I am pleasantly surprised. The quality and fit and finish of the glasses are excellent. While they need a little adjustment, which is to be expected, even when purchased at a store, the overall price and experience was smooth and efficient. I was amazed at how quickly they arrived. My wife said she's going to check out the site and order a pair, as well. One can't beat the price! I was fitted just recently for bifocals at Lenscrafters at a cost of more than $350 for one pair of glasses no scratch-resistance or anti-glare coatings. The quality of the frame was okay, for $100, but the lenses - I still couldn't see very well. I needed a second pair of glasses as a backup pair, and thought to myself that it was worth a try to purchase them online that I really didn't have much to lose. Eyewear Insight had the best prices, best frame selection, easiest ordering process, and the easiest to use website. The anti-scratch and anti-glare features were included in the lens price, and there was a wide variety of lenses to choose from. I found a frame I liked, put in all of my prescription information, and went through the easy checkout process. In a relatively short period of time, I received my new glasses. They looked great, but my biggest surprise was that I see BETTER with them than I do with my $350 Lenscrafters pair! My backup pair suddenly became my primary pair of glasses, and I couldn't be more pleased! Eyewear Insight is fantastic, and I would highly recommend to anyone including bifocal wearers to give them a try. You certainly won't be disappointed! In fact, I will be ordering another pair to be my NEW backup pair and put the Lenscrafters glasses away for an emergency like the dog eating my first Eyewear Insight pair and me losing the second Eyewear Insight pair that I'll be ordering soon. I was very pleasantly impressed love my glasses its nice, perfect and a great price and the fact that it was delivered so fast was an added pleasure. Thanks keep up the great job. THANK YOU for these wonderful glasses! The quality, the durability of the frames, the fast shipping and the friendly service I received from the team was fantastic. I ended up asking a few questions after my order was placed and was pleased to receive such great service. Plus the glasses are beautiful and they look great on me - no hassle shipping and I'll definitely order again. Can't thank you enough! I just bought some women's reading g lasses and am very happy with the frames. They are better than I expected, fashionable and unique. The customer service is also excellent. The last glasses I ordered were too big and slid off my face. I was offered a replacement pair and am very happy with what I selected. Now I know how to order so I opt for the shorter frames. I just received my first pair of online progressive lens eyewear. I had been reluctant to purchase eyewear online, but my glasses arrived yesterday and what a pleasant surprise! I had become used to spending hundreds more for the same prescription glasses, and the pair I just purchased from EyewearInsight.com provide me with flawless vision, and I love the violet frames I was able to select, too! Great job! !